Robert Mackay Fripp was an architect who lived at 2061 Beach Avenue from 1910 to 1914. His wife, Christina, lived at 1054 Denman Street in 1919. 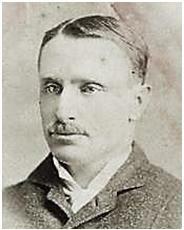 Robert Mackay Fripp was born in Clifton, Gloucestershire, near Bristol, on December 16, 1858. His father was George Arthur Fripp (1813-1896), who was a well-known painter in England. Robert’s mother was Mary Percival (1825-1887). Thomas William Fripp (1864-1931) was Robert’s brother, and was a successful artist and photographer in British Columbia. Robert’s early schooling was at Belsize Manor and Lancing College in England. In 1874, he began to study architecture. He was articled to J.S. Dodd, an architect in Reading, Berkshire for three years. Then he studied at the Kensington Art School and the British Museum, and worked with Sir Horace Jones, who was an architect for the City of London. In 1880, Robert went to Australia, and worked in various offices in Adelaide, Melbourne and Sydney. In 1881, he moved to New Zealand, and by 1884, he was practicing as an architect in Auckland, New Zealand. While he was living in Auckland, he married Christina Nichol on Feb. 27, 1887. He carried on an architectural practice in New Zealand until 1888, until an economic downturn caused a drop in the need for architects. He travelled to North America, and arrived in Vancouver in 1888. 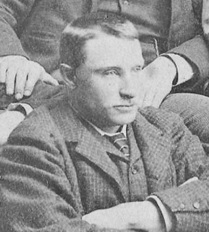 R. M. Fripp, 1888; detail from Mainland Football Team; Vancouver City Archives, LP 334; https://searcharchives.vancouver.ca/mainland-football-team. The Fripp family stayed in Vancouver until about 1896, when they went back to New Zealand, but only for about two years. By 1898, Robert was back in Vancouver. From 1901 to 1908, he travelled and worked, mostly in England and California. By 1908, he was again in Vancouver, where he stayed until he died on December 16, 1917. He was interested in a great variety of issues relating to art, architecture, civic pride, and society in general. He tended to have strong opinions, which sometimes led to difficult relations with artists, architects, and other professionals. He was also active in many sports, including cricket, rowing, shooting, and football. He made several allegiances with professional associations. In 1901, he became a fellow of the Royal Institute of British Architects, but he later resigned. In 1906, he became a certified architect in California. In 1910, he was made a fellow of the Royal Society of Arts. He was the president of the Canadian Handicrafts Guild in Vancouver, and was the vice-president of the Arts Historical and Scientific Association. 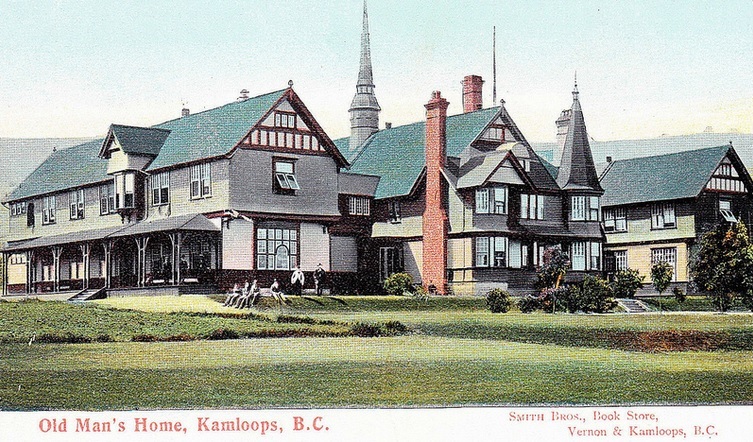 He designed a wide variety of houses, as well as many larger projects, including the Provincial Home for Old Men in Kamloops, British Columbia. Unfortunately, although some of his buildings still exist, many were demolished, and they now live on only as drawings and photographs. From time to time there have been debates about his architectural skills. He had good training and a broad experience in England, New Zealand, Canada, and the United States. He isn’t as well-known as other Vancouver architects from his era, such as Samuel MacLure, Thomas Fee, and William Tuff Whiteway, and this is unfortunate, because he made a significant contribution to Vancouver’s cityscape. Christina Fripp died in Santa Monica, California on March 9, 1923. Robert and Christina had five children, all of whom were born in Vancouver. 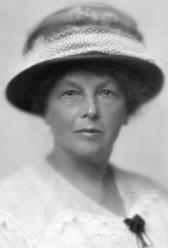 Alice Marion Fripp was born in Vancouver on May 19, 1888. She did not marry. She died in New Westminster, British Columbia on October 19, 1928, and was buried in Mountain View Cemetery in Vancouver. Robert Arthur William Fripp was born in Vancouver on May 16, 1889. He died on August 6, 1889, and was buried in Mountain View Cemetery in Vancouver. Dorothea Fripp was born in Vancouver on April 27, 1890. She married Frank Bellamy in 1919. He had served in the First World War, and he died later in 1919 from war wounds. He was buried in Mountain View Cemetery in Vancouver. In 1920, Dorothy was staying in California with Frank Dukinfield Jones and his wife Mona Beryl (née Perry). Dorothy Bellamy died on April 1, 1938. She is buried in Mountain View Cemetery in Vancouver. George Mackay Fripp was born in Vancouver on August 25, 1891. He did not marry. He enlisted in the Canadian Expeditionary Force in the First World War, and he died in France on April 17, 1917. Clifford Russell Fripp was born in Vancouver on July 23, 1899. On January 14, 1925, in Vancouver, he married Rosalie Marion Morris. She was born in Vancouver on October 11, 1892. Her father was Maxmilian Patricio Morris (1862 (or 1864)-19–), who ran a business in Vancouver, and who was the Vancouver consul for Chile; her mother was Leah Harris (1870-19–). Clifford died in Vancouver on April 22, 1942, was he buried in Mountain View Cemetery in Vancouver. After Clifford died, Rosalie acted as the president of M.P. Morris Ltd. By 1954, Rosalie was married to Cyril Harry North, who was an export manager dealing in British Textiles. Cyril was born in London, England on May 18, 1888. He died in North Vancouver, British Columbia on November 18, 1970. Rosalie died in North Vancouver, British Columbia on August 21, 1984, and she was buried in Mountain View Cemetery in Vancouver. George Arthur Fripp, Wikipedia article, http://en.wikipedia.org/wiki/George_Arthur_Fripp. “England Births and Christenings, 1538-1975,” index, FamilySearch (https://familysearch.org/pal:/MM9.1.1/J91V-YBJ : accessed 12 Jun 2013), George Arthur Fripp, 1813. “England Births and Christenings, 1538-1975,” index, FamilySearch (https://familysearch.org/pal:/MM9.1.1/NN28-W2G : accessed 12 Jun 2013), Geo. Arthur Fripp, 19 Jul 1813. “British Columbia Marriage Registrations, 1859-1932,” index and images, FamilySearch (https://familysearch.org/pal:/MM9.1.1/JDZ6-KLJ : accessed 12 Jun 2013), George Arthur Fripp in entry for Thomas William Fripp and Gertrude Maude Muriel, 1897. “British Columbia Death Registrations, 1872-1986,” index and images, FamilySearch (https://familysearch.org/pal:/MM9.1.1/FLVG-JPV : accessed 12 Jun 2013), George Arthur Fripp in entry for Thomas William Fripp, 1931. Mary Percival (1825-1887), Family Search Community Trees, http://histfam.familysearch.org/getperson.php?personID=I49218&tree=Nixon. Although he often called himself “R. Mackay Fripp,” I have called him “Robert” to distinguish him from other members of the family who also had “Mackay” as part of their name. “Robert Mackay Fripp,” Howay and Scholefield, British Columbia from the Earliest Times to the Present, Vol 3, pages 291-292; http://archive.org/stream/britishcolumbiaf00schouoft#page/291/mode/1up; http://archive.org/stream/britishcolumbiaf00schouoft#page/292/mode/1up. “Fripp, Robert Mackay,” Who’s Who in Western Canada, 1911, pages 179-180; http://www.ourroots.ca/e/page.aspx?id=643173; http://www.ourroots.ca/e/page.aspx?id=643174. “R. Mackay Fripp,” Vancouver Daily World, Souvenir Edition, , page 22, http://archive.org/stream/cihm_16312#page/n48/mode/1up. “Robert Mackay Fripp,” Donald Luxton, Building the West, Vancouver, Talonbooks, 2003, pages 158-162; page 504. Edward Mills, “The Buildings of Samuel Maclure: In Search of Appropriate Form: Book Review,” society for the Study of Architecture in Canada Bulletin (June 1990), Volume 15, No. 2, pages 52-53. Page 53 includes an outline of Robert Mackay Fripp’s architectural background. “For Indigent, Aged and Infirm Persons: The Provincial Home for Old Men,” [Undated. Refers to events up to 1975. ]; http://www.kamloops.ca/museum/archives/pdfs/N673%20-%20The%20Provincial%20Home%20for%20Old%20Men.pdf. 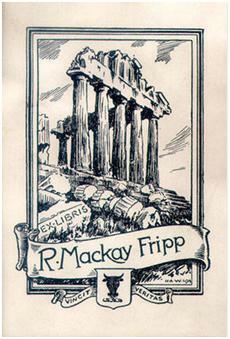 “Robert Mackay Fripp,” Biographical Dictionary of Architects in Canada, 1800-1950, http://www.dictionaryofarchitectsincanada.org/architects/view/1577. 1911 Census of Canada, British Columbia, Vancouver, 3 Vancouver City, page 10, family 104, lines 23-28, R W [sic] Fripp, http://automatedgenealogy.com/census11/View.jsp?id=63744&highlight=23&desc=1911+Census+of+Canada+page+containing+R++W+Fripp. “British Columbia Death Registrations, 1872-1986,” index and images, FamilySearch (https://familysearch.org/pal:/MM9.1.1/FLK8-36B : accessed 08 Aug 2013), Robert Mackay Fripp, 1917. “Mr. R. Mackay Fripp, F.R.I.B.A., the well-known local architect, died at his residence, 2056 Fourth avenue east, on Sunday morning. Mr. Fripp came to Vancouver just after the fire and had entrusted to his care the preparation of plans for many of the larger buildings and residences of the city. He was also a prominent sportsman, and took a great interest in football, rowing and shooting. He was one of the pioneer members of the Rowing Club. Mr. Fripp was regarded as an authority on architectural metters, and was frequently heard on public platforms on this and kindred subjects. He is survived by his widow, one son and two daughters. His other son, Pte. George Fripp, was killed recently in France, having gone overseas with the 11th C.M.R.’s. The funeral is to be held from the family residence on Tuesday at 2 p.m.
A brother, Mr. T.W. Fripp, is a prominent artist of Mission City, another brother was a war artist, while the father was a noted artist of the Royal Academy in London. 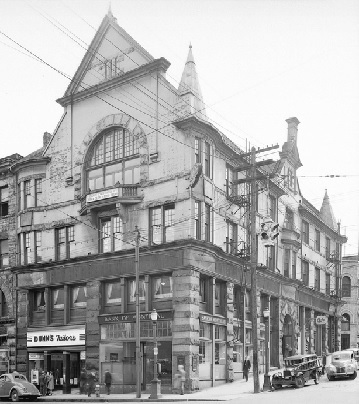 O’Brien Hall – Southeast corner of Homer Street and Hastings Street – Vancouver City Archives Bu N135 – Photo May 3 1940. “British Columbia Birth Registrations, 1854-1903,” index and images, FamilySearch (https://familysearch.org/pal:/MM9.1.1/JDZK-Z2G : accessed 07 Aug 2013), Alice Marion Fripp, 1888. “British Columbia Death Registrations, 1872-1986,” index and images, FamilySearch (https://familysearch.org/pal:/MM9.1.1/FL2F-V9D : accessed 08 Aug 2013), Alice Marion Fripp, 1928. Alice M. Fripp, Find a Grave, Mountain View Cemetery and Crematorium , Vancouver, British Columbia, Canada, Plot: OLD/2/02/002/0009; http://www.findagrave.com/cgi-bin/fg.cgi?page=gr&GSln=fripp&GSfn=alice&GSbyrel=all&GSdyrel=all&GSob=n&GRid=26304185&df=all&amp;. British Columbia Birth Registrations, Registration Number: 1889-09-115545, Robert Arthur William Fripp. “British Columbia Death Registrations, 1872-1986,” index and images, FamilySearch (https://familysearch.org/pal:/MM9.1.1/FL26-YQ3 : accessed 07 Aug 2013), Robert Arthur William Fripp, 1889. “British Columbia Death Registrations, 1872-1986,” index and images, FamilySearch (https://familysearch.org/pal:/MM9.1.1/FL26-YQ7 : accessed 07 Aug 2013), Robert Arthur William Fripp, 1889. R.A.W. Fripp, Find a Grave, Mountain View Cemetery and Crematorium, Vancouver, British Columbia, Canada, Plot: OLD/2/02/002/0009, http://www.findagrave.com/cgi-bin/fg.cgi?page=gr&GSln=fripp&GSbyrel=all&GSdyrel=all&GScntry=10&GSob=n&GRid=26264312&df=all&amp;. “British Columbia Marriage Registrations, 1859-1932,” index and images, FamilySearch (https://familysearch.org/pal:/MM9.1.1/JDZP-8LR : accessed 07 Aug 2013), Frank Bellamy and Dorothy Fripp, 1919. Canadian Virtual War Memorial, In memory of Sergeant Frank Bellamy who died on December 2, 1919, http://www.veterans.gc.ca/eng/collections/virtualmem/Detail/420682?FRANK%20BELLAMY. “United States Census, 1920,” index and images, FamilySearch (https://familysearch.org/pal:/MM9.1.1/MHQJ-3RT : accessed 07 Aug 2013), Dorothy Bellamy in entry for Frank D Jones, 1920. “British Columbia Marriage Registrations, 1859-1932,” index and images, FamilySearch (https://familysearch.org/pal:/MM9.1.1/JD8P-62V : accessed 07 Aug 2013), Frank Dukinfield Jones and Mona Beryl Perry, 1913. “British Columbia Death Registrations, 1872-1986,” index and images, FamilySearch (https://familysearch.org/pal:/MM9.1.1/FLGR-55Y : accessed 07 Aug 2013), Dorothy Bellamy, 1938. Dorothy Bellamy, Find a Grave, Mountain View Cemetery and Crematorium, Vancouver, British Columbia, Canada, Mountain View Cemetery and Crematorium, Plot: OLD/2/02/002/0011, http://www.findagrave.com/cgi-bin/fg.cgi?page=gr&GSln=bellamy&GSfn=dorothy&GSbyrel=all&GSdyrel=all&GSob=n&GRid=26264314&df=all&amp;. British Columbia Birth Registrations, Registration Number: 1891-09-115555, George Mackay Fripp. British Columbia Birth Registrations, Registration Number: 1899-09-119086, Unknown Fripp; Date: 1899/07/23. “British Columbia Marriage Registrations, 1859-1932,” index and images, FamilySearch (https://familysearch.org/pal:/MM9.1.1/JD8R-VKW : accessed 08 Aug 2013), Clifford Russel Fripp and Rosalie Marion Morris, 1925. British Columbia Marriage Registrations, Registration Number: 1925-09-289455; Clifford Russel Fripp and Rosalie Marion Morris. “British Columbia Death Registrations, 1872-1986,” index and images, FamilySearch (https://familysearch.org/pal:/MM9.1.1/FLR5-S8P : accessed 08 Aug 2013), Clifford Russell Fripp, 1942. “British Columbia Death Registrations, 1872-1986,” index and images, FamilySearch (https://familysearch.org/pal:/MM9.1.1/FLYK-37V : accessed 08 Aug 2013), Rosalie Fripp in entry for Cyril Harry North, 1970. British Columbia Death Registrations, Registration Number: 1970-09-015576, Cyril Harry North. “British Columbia Death Registrations, 1872-1986,” index and images, FamilySearch (https://familysearch.org/pal:/MM9.1.1/FGMM-XPL : accessed 08 Aug 2013), Rosalie Marion North, 1984. Rosalie Marion North, Find a Grave, Mountain View Cemetery and Crematorium, Vancouver, Greater Vancouver Regional District, British Columbia, Canada, Plot: OLD/2/02/002/0012, http://www.findagrave.com/cgi-bin/fg.cgi?page=gr&GSln=north&GSfn=rosalie&GSbyrel=all&GSdyrel=all&GSob=n&GRid=26372933&df=all&.